The best wedding cake orders are from couples who Sticky Fingers Cake Co have been recommended to, so when Stephanie and Chris came to me via Stephanie’s Mum, who’s wedding cake I had made last year, I couldn’t wait to create something special for them! 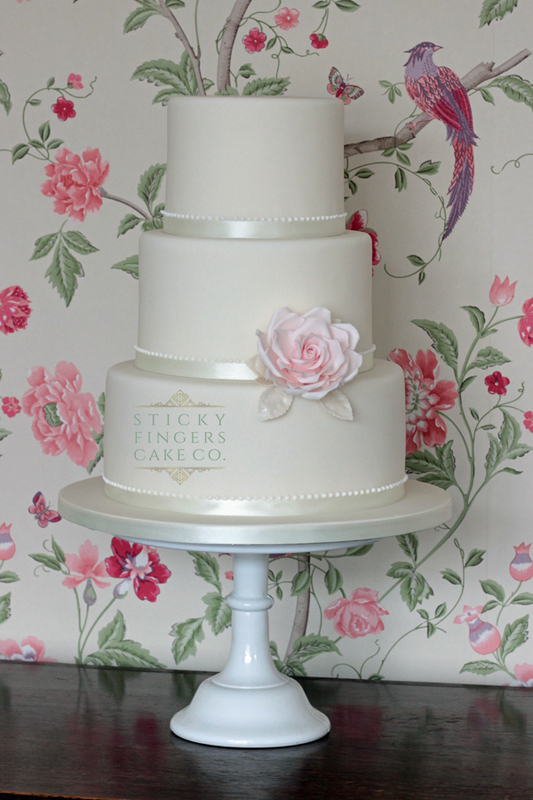 Their cute three tier iced wedding cake was decorated with a simple pale pink open sugar rose. They collected their cake from us and travelled up to the awesome (10-11) Carlton House Terrace, just off Pall Mall, so only the bottom tier was real and the other two tiers were dummy. I also made two cutting cakes for them to make up the portions. Yummy flavours of Cherry Bakewell, Carrot and Pecan and Zesty Orange. Wishing you all the happiness in the world for the future!